Going back to the concept of ‘heterotopy’ (other space), today I’ve come upon a beautiful machinima entitled ‘Land of Illusion’ by Beijing media artists Lily Xiying Yang and Honglei Li (杨熙瑛, 李宏磊). It’s a very dense and multilayered tale about freedom of thought and cultural isolation and it interestingly superimposes different Chinese traditions and folkloristic elements, both of its glorious past (from the literary classics such as the ‘Dream of the Red Chamber’ and the legend of the ‘Hundred Schools of Thought’ to the religious taoist beliefs, the emblematic profile of the Great Wall and the traditional Chinese scroll-paintings) and elements from its chaotic and contradictory present (from the contested Three Gorges Dam to the intense figure of a modern woman wearing a blood-stained mask, reminding many contemporary social issues, from censorship to the role of women in society or the recent mortal bird flu). ‘Land of Illusion’ interweaves tradition and globalization and it’s a perfect and beautiful example of the unlimited artistic possibilities offered in a virtual platform such as SL. 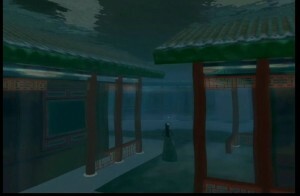 What I personally like especially in this machinima is the highly refined accumulation of symbols, emblems and visual metaphors: from the powerful and visually effective Great Wall in flame (I like to interpret it as a symbol of openness to the outside world) to the submerged world under the sea (another ‘heterotopy’ inside the biggest one of SL) and the final intense character of the silenced Chinese girl. Unfortunately the actual SL sim of ‘Land of Illusion’ is currently unavailable and you can only teleport your avatar to the nearest Museum of Contemporary Art, which is apparently the original setting of the machinima. (DSL Cyber MoCA – Museum of Contemporary Art in SL, http://dslcybermoca.net, UQBAR 164, 237, 35). 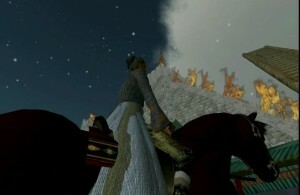 You are currently reading Lily & Honglei: “Land of Illusion” Machinima at .